The Art Affordable Housing Finance (formerly known RAAS) by NCUBE Design - ArchitectureLive! 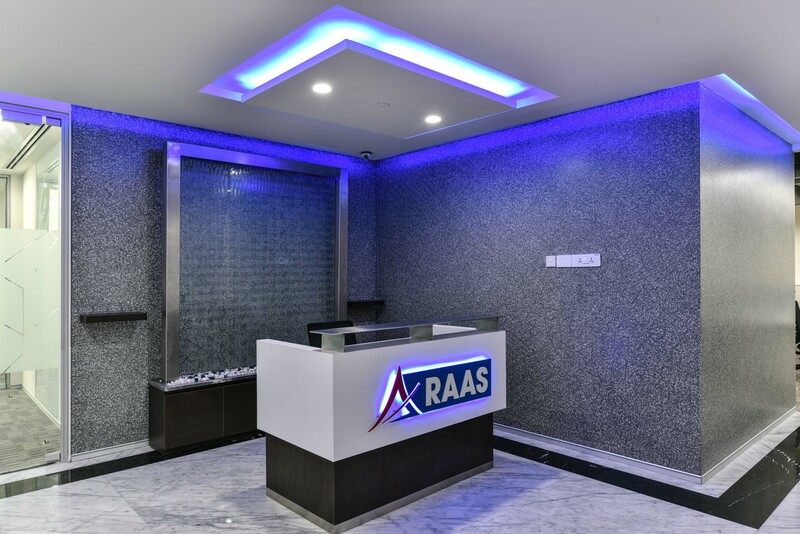 RAAS is a housing and finance firm located at One Indiabulls Centre, Mumbai. 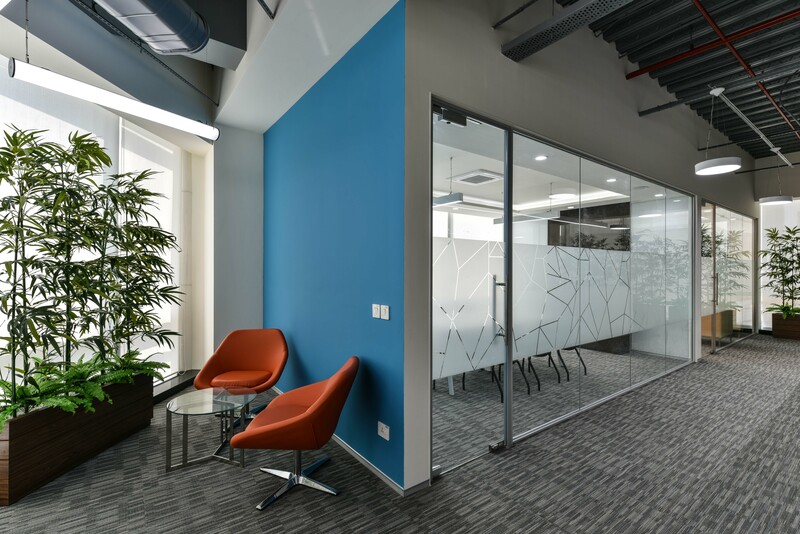 Spread across two floors, the design brief required a professional office space that would incorporate comfort, flexibility and creativity in workspaces. A close-knit layout has been adopted for the entire office. The transition from the lift lobby is marked by two passageways that are perpendicular to each other. 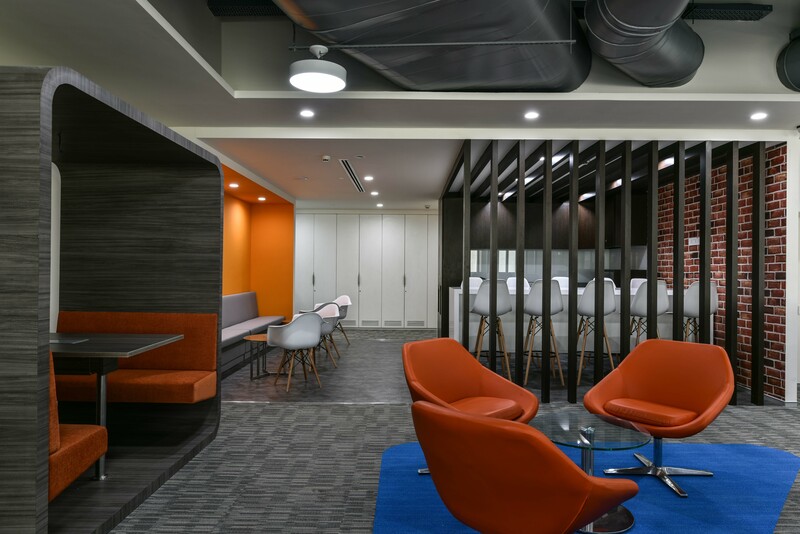 One passageway leads to all the management cabins, that open up further into a well-lit collaboration space. 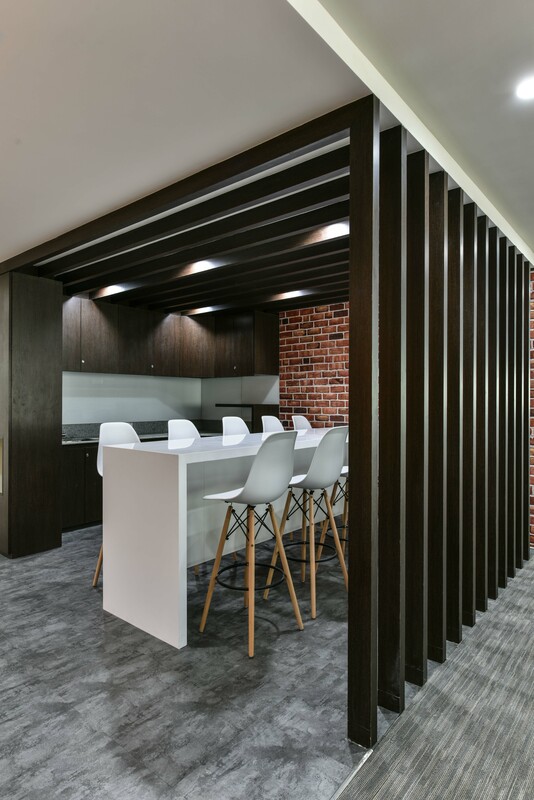 The other passageway incorporates the service entry, storage, washrooms and pantry, efficiently segregating the movement in the office to enhance functionality. 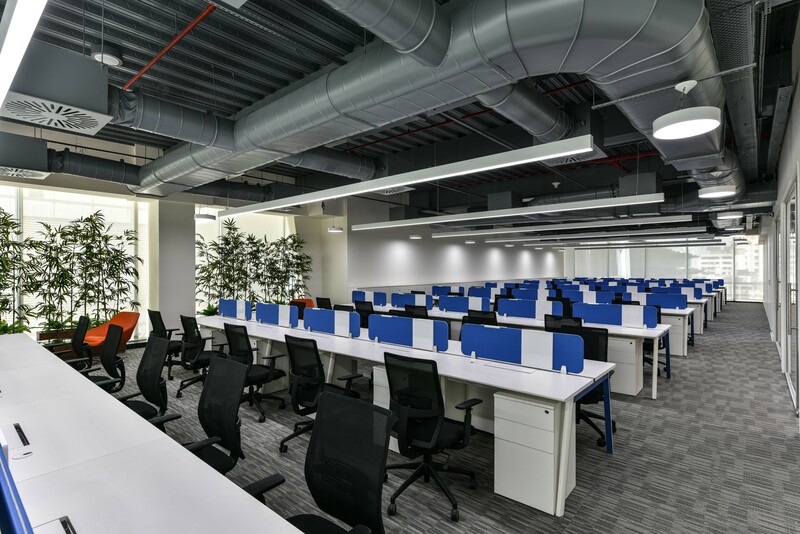 Furthermore, the territory of collaboration zone is marked by meeting rooms and cabins opening inwards to foster interactivity. 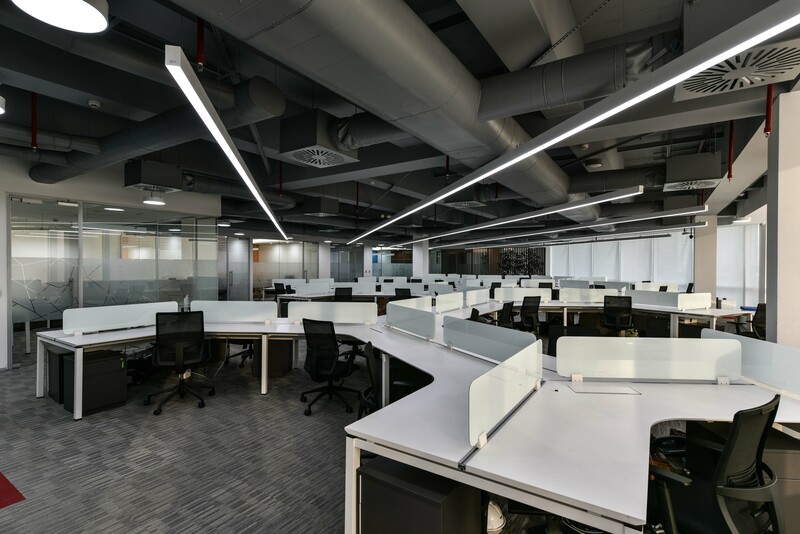 On the lower floor, the workstations in the collaboration zone have been laid out diagonally to bring dynamism to the space and align the views to the angled glass facade. 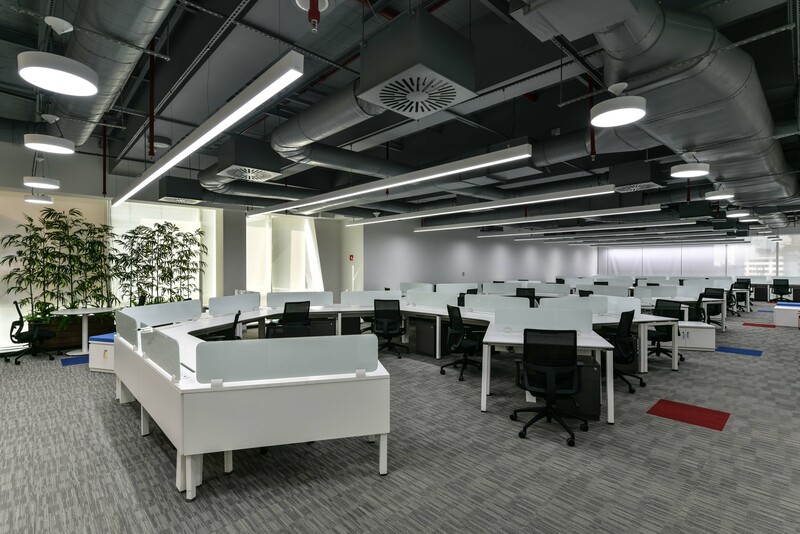 On the upper floor, a honeycomb seating layout has been used to optimally utilize workspace, collection space and movement. The hexagonal layout provides centrality to groups while promoting interaction and efficient exchange of ideas. 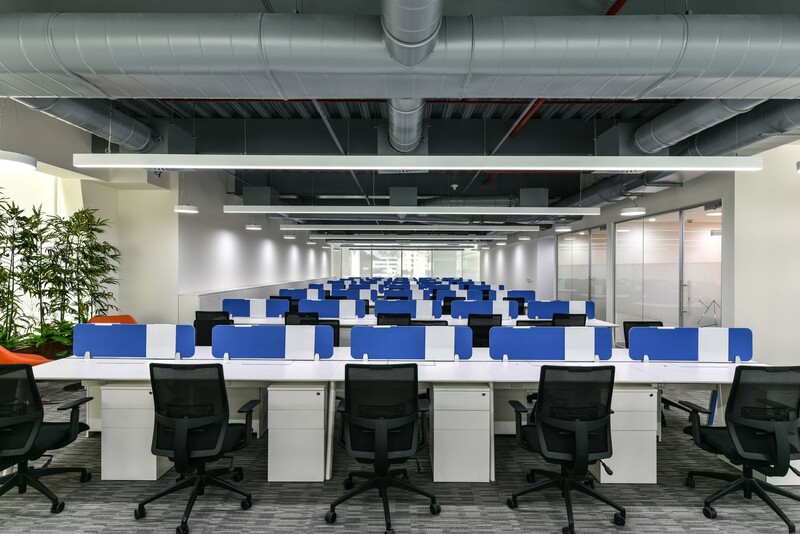 While adopting an unconventional layout for workstations, the entire space is interspersed with a variety of seating layouts to provide multiplicity in the use of the workspace and enhancing the scope for team building interactions. 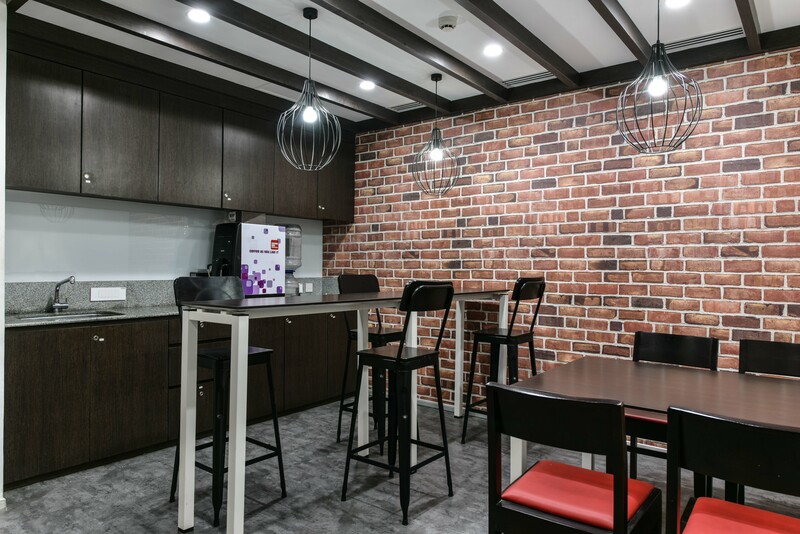 Larger seating sections are incorporated in addition to bars and high stools to incorporate more number of people, as well as keep the layout open and spacious. 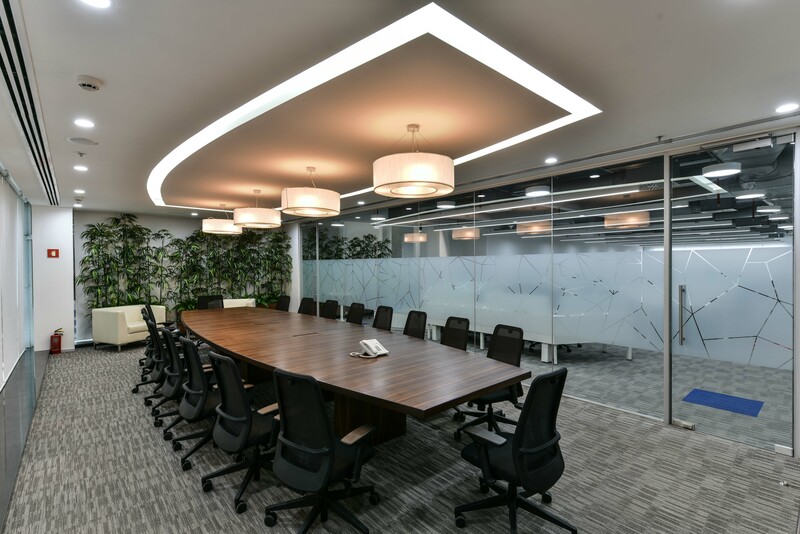 Pods have been included for private discussions, as and when required. 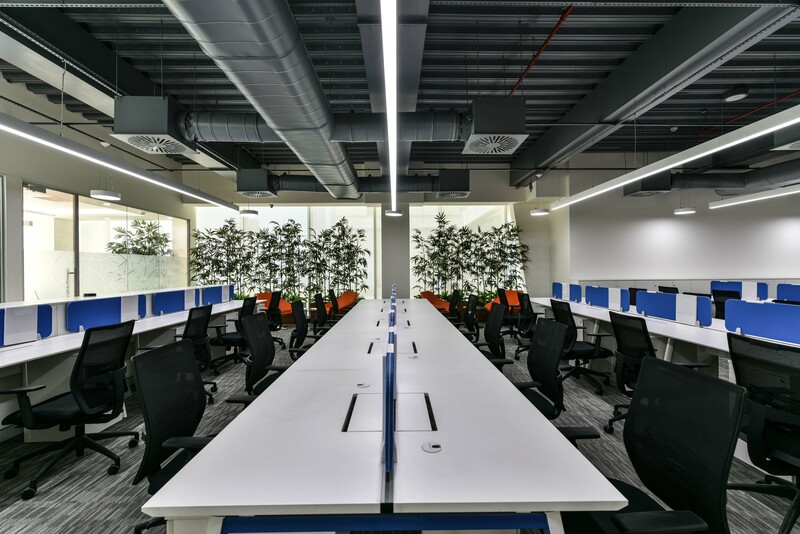 The entire layout and selection of furniture speaks of multi-functional and temporal nature that will come to define the culture of the organisation over years of use. 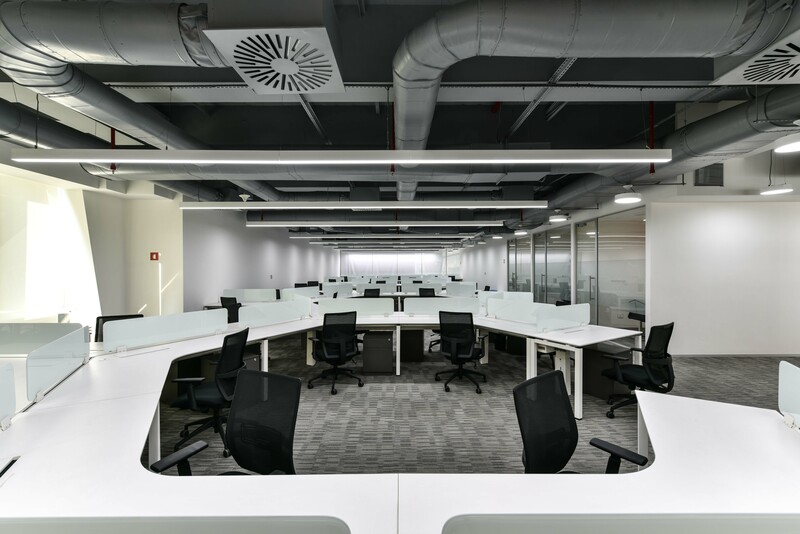 A raw industrial aesthetic is adopted to enhance the experience of the overall volume of space. 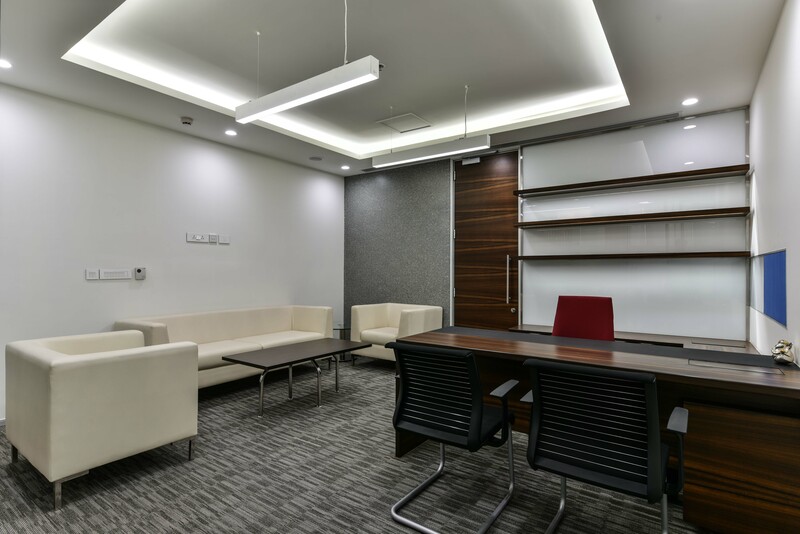 By removing the false ceiling, it also serves to be an economical and modular approach. 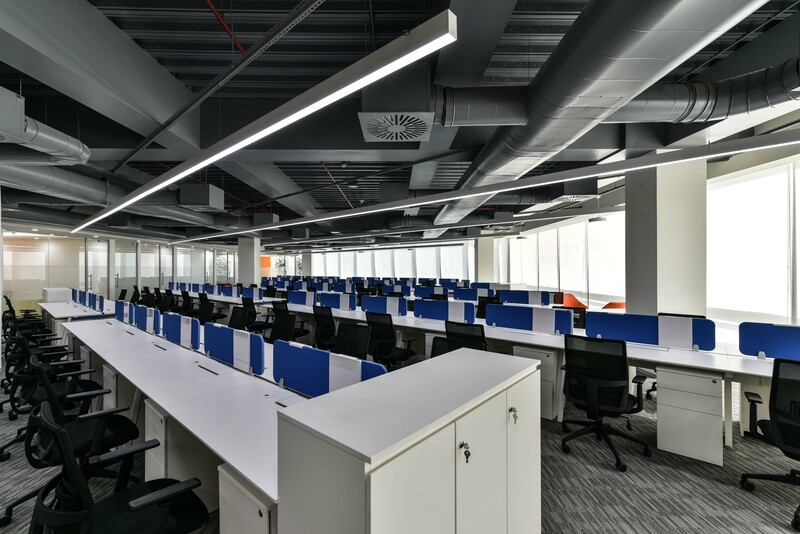 The entire office is defined by an aesthetic of exposed ceilings with ducts, trays and shafts painted black for a muted depth overhead. 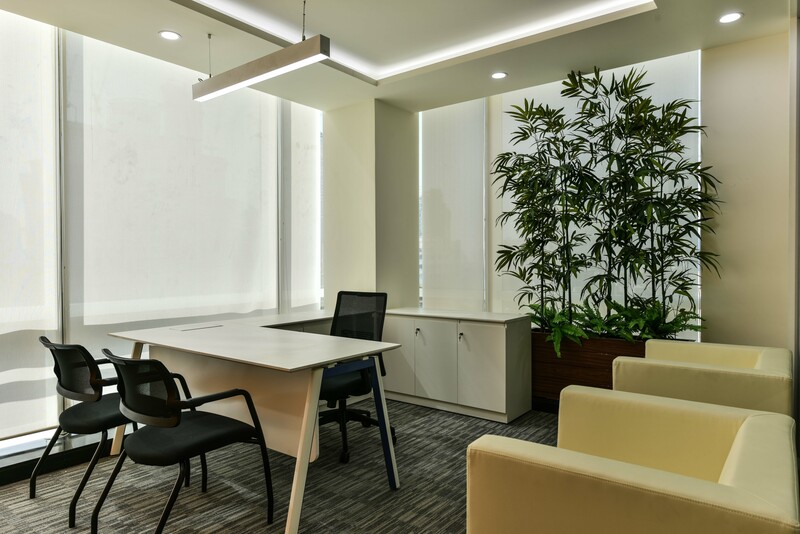 The black colour continues to merge with some partitions and slits to merge the ceiling with screens and present a coherent look to structure of the space. 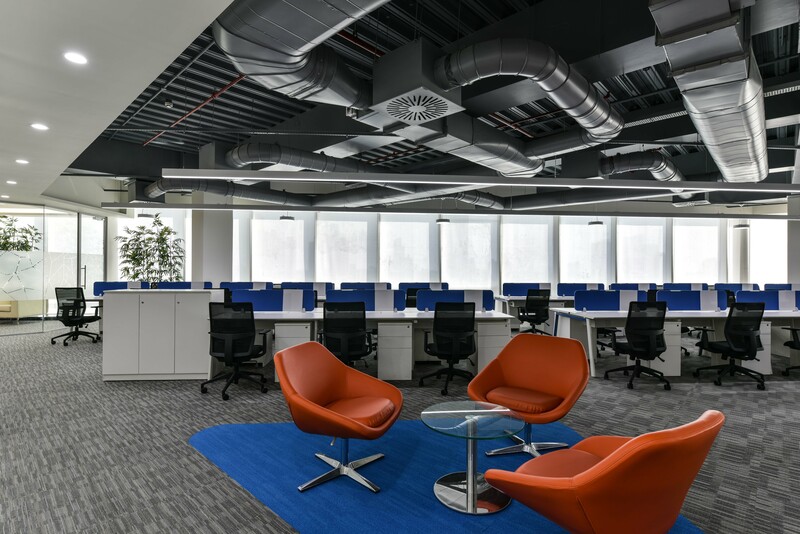 Cool tones of grey and blue have been used in the furniture and flooring to maintain a quiet ambience and keeping the entire setup peaceful and maintaining a serene atmosphere. 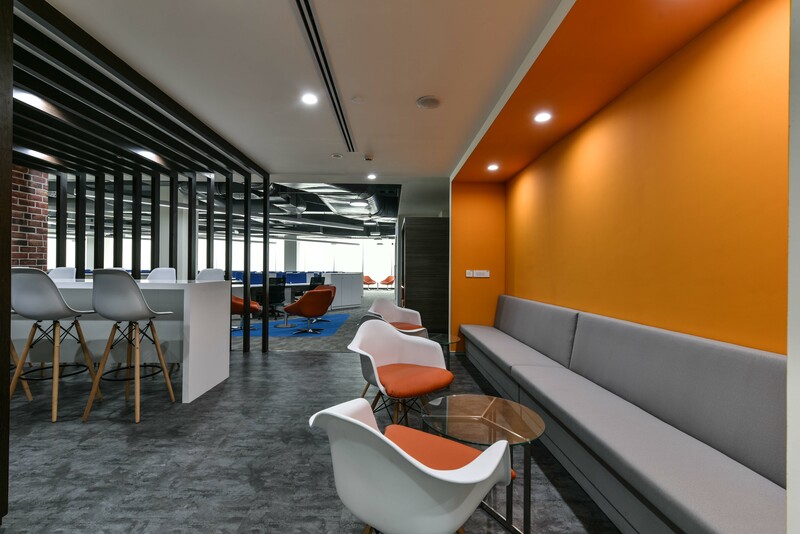 Multiple break-out zones, smaller collaboration spaces and interaction spaces, reveal bouts of bright warm colour to add playfulness to the environment and foster creativity. 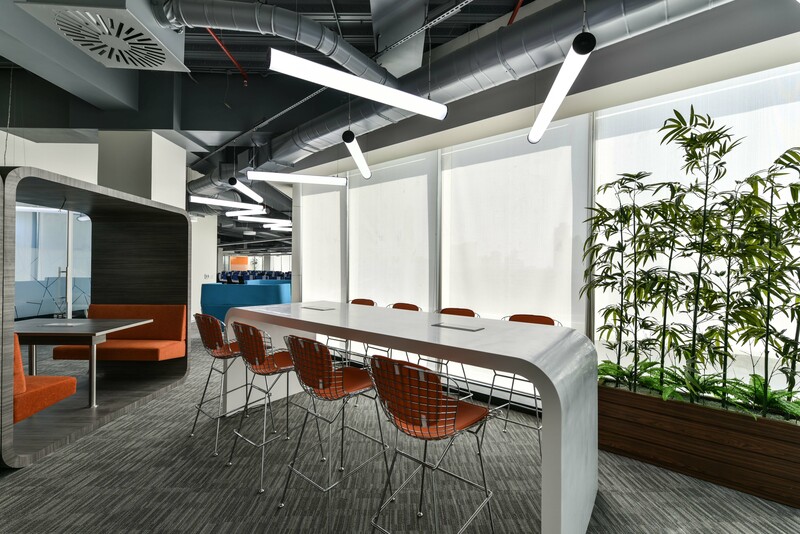 Such stimulating design elements and furniture are a move to break any monotony. 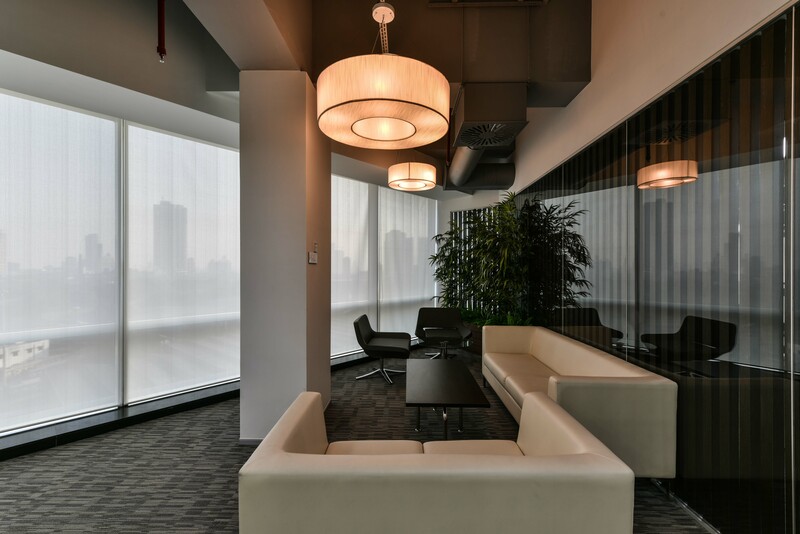 Large spans of glass facade open up space, bring in ample natural light and merge the interior with exterior. Louvers diffuse the daylight, flushing the entire space with a softness and warmth against the heavy skyline of Mumbai. Thus, the entire space confines users gently within. A lining of bamboo planters placed against glass screens mark view of the space at end of all passageways. This gives the space an open feeling by bringing outdoors in. 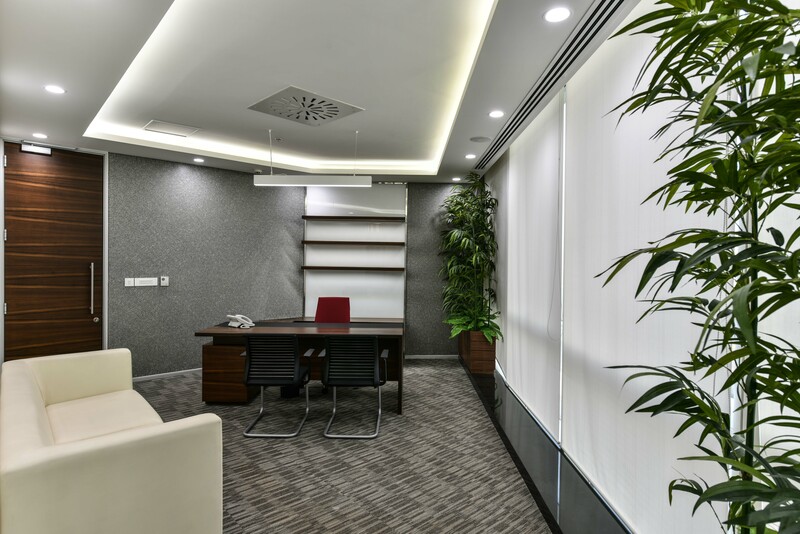 Not only does it contribute to an improved indoor air quality, but the greenery also benefits the users psychologically and facilitate longer working hours by reducing stress.